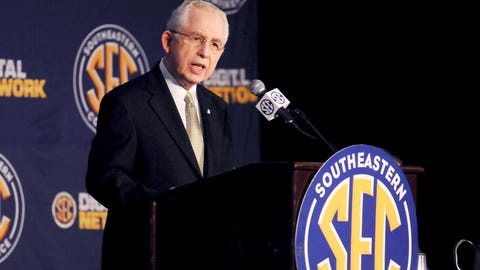 Under Mike Slive's watch, the SEC has prospered and become the nation's most successful conference. The other day, our friend Braden Gall over at Athlon Sports did an analysis regarding which states produce the most top-tier talent in college football. Predictably, the Big Three — Florida, California and Texas — were well represented, accounting for 40 percent of the 1,000-player sample Gall studied in the last five years (he took the top 200 recruits ranked in each class from 2010-14). One item from Gall’s piece that stood above the rest to me: the attractiveness of Virginia and North Carolina to conferences looking to expand, specifically the SEC. And you would be correct about those choices, particularly those in the first two categories. According to Gall’s research, Georgia ranks fourth in top-200 players over the last five years (78), followed in order by Ohio (47), Alabama (39) and Louisiana (37). But unless you’re among the devoted who closely track college football recruiting, you probably wouldn’t immediately think of the hoard of talent that sprouts from, say, Virginia’s Chesterfield County or North Carolina’s Mecklenburg County. You might think of college hoops in those areas before anything else. Yet in Gall’s study, Virginia ranked eighth in top-200 recruits over the last five years with 36, while N.C. ranked ninth at 32. Both states beat out the home of an iconic football school (Pennsylvania), the fifth-largest state in the U.S. with the third-largest television market (Illinois), the ninth-largest state with the 11th-best TV market and a powerful brand-name program (Michigan) and New York City’s suburban neighbor (New Jersey). Of course, that’s an admittedly rough gauge of a one-year window in football talent. 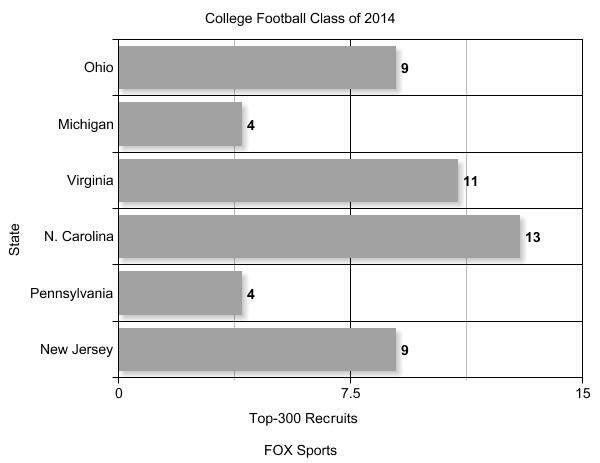 For whatever it’s worth, the early projections of the 2015 recruiting rankings have Virginia with 15 top-300 recruits and North Carolina with 13. The point still stands strong, though — Virginia and North Carolina are well-mined territories, two fertile landscapes the most powerful conference in college football has at its disposal yet isn’t fully tapping into yet. Outside of the adjacent South Carolina — the Gamecocks had 14 players from North Carolina on its 2013 roster — the best SEC teams in recent seasons aren’t being heavily influenced by Virginia and North Carolina talent. Last season, Alabama had two players from Va. and zero from N.C. on its roster. LSU had two and three, respectively. Auburn, the league’s champion and national runner-up, came in at zero from Virginia and one from North Carolina. The primary reason for this is obvious — those programs don’t need this particular pipeline of talent. They reside in some of the nation’s most rich recruiting states and have the pedigree to pull from Florida and Texas and California and, well, anywhere. This creates opportunity for the mid-tier SEC teams. For instance, Tennessee seems to be going after its slice of the Va.-N.C. action, with eight total players from those states on last season’s squad. If the league grabbed a program in those states — Virginia Tech and NC State, as Gall offered up, or perhaps North Carolina, my alma mater — that talent door would figure to open even wider. Both states rank in the top 12 in population according to the latest U.S. census – North Carolina at No. 10 (9.8 million) and Virginia at No. 12 (8.3 million) – and N.C. offers something interesting on the television front. The Tar Heel State doesn’t possess a mega media market, but it does offer two strong ones: Charlotte ranks 24th and Raleigh-Durham ranks 27th among national TV markets, both better than San Diego, Nashville and other notable locales. Look, the SEC sure as hell doesn’t need to gain strength, and as a proud Atlantic Coast Conference alum, I’d like to see the ACC prosper by continuing to strengthen its college football footprint — Florida State’s national title run in 2013 and the addition of Louisville in 2014 sure helps — and maintaining the terrific basketball culture the conference enjoys. But Slive rules an empire that feasts on what it wants, making it difficult to peruse the landscape, see Virginia and North Carolina sitting there like succulent little doe, and not envision the SEC’s insatiable appetite revving up once more.